Behind the hustle and bustle of Jakarta, there are many educational attractions are hidden behind the concrete jungle of the metropolis. Many museums in Jakarta that is not well known even by local residents of this city. Though the collection and attractions offered are not inferior to the museum can be found in Europe. After you read the article and laid low price educational tour around Jakarta earlier, now a team of asiafreetravel.com will discuss the continuation of the previous article. Here are some inexpensive educational tourist attractions that you can visit around Jakarta. The location of this resort is located in the complex of Taman Fatahillah. You just walk about 10 minutes from the kota busway terminal. While walking, you can enjoy the exotic beauty of the old buildings around the park. This place is often used as a location for pre-wedding photo shoot and magazine model background. This exploration starts from the former city hall building that was established in Batavia in 1707. The museum is exhibiting a collection of more than 500 historical relics such as VOC relics paintings, furniture, ancient money, home furnishings since pre-historic times, the dungeon, replica inscription in Jakarta, the cannon Jagur, musical instruments and sculptures Tanjidor Betawi traditional wedding. The museum is also a lot to save the rest of the Netherlands cruelty. You can go to the second floor to see the room that was once used to watch the torture of indigenous convicted in the court building. If the execution of the sentence will be carried out, the Dutch government officials will ring the bell located at the top of the building. In the basement are located under the stairs leading to the rear garden, there is a dungeon. The prison consists of a basin as high as the shoulders of adults. So it is conceivable that the prisoners should be stood head bowed legs tied with chains. While the underground prison for women located in the courtyard of the museum. The women prisoners soaked in water as high as the ears for several months. Many prisoners who has died in just a month. Even according to the stories from local people, they are often thrown snakes. Fear the sinister atmosphere? you can go to the park located at the rear of the museum. Here comes the cheerful atmosphere with a fountain that supposedly had been a major source of water in Batavia. This fountain is also accompanied by the robust cannon which is very famous among the Dutch princess because it is considered as a symbol of fertility. Jakarta History Museum is located at Taman Fatahillah. You simply pay Rp.2000 to get into the museum complex. The museum is open on Saturdays until a week from 09:00 until 15:00. Do not come to this museum on Monday and national holidays because it is usually closed. Many people say to spend vacation time to the museum is an ancient idea. Though the place is now a museum tour is becoming a trend in society. There is even a community like this. The next destination is the Wayang Museum. Puppet museum is one of the historic buildings in the Old City area. Located hidden because flanked by several buildings that have been abandoned. However, this place is quite prominent with a red roof and a huge wooden door. The shape is like the old church building that is consistent with the function of these buildings when the Dutch colonial era. When tourists came into the room, you are greeted by a pair of ondel-ondel Betawi. In addition to a collection of puppets from various regions in the archipelago and the world, the museum is also exhibiting a wide range of wooden dolls. Basically it means wooden doll puppets played by a puppeteer. The room was first explored the room above. You will be presented with a variety of different kinds of puppets in the shape and size of this room. there is even a statue of a famous puppet with a size almost as tall as a human. Moreover, in this room also described the anatomy puppet. 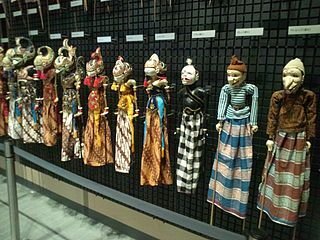 Some collection of puppets from various places in the island of Java is also there, of course with a different name. In this room you can also see a revolution in the form of puppet presidents, soldiers, and heroes of Indonesia. Here you can also find a child who is a puppet chess. Some puppets and dolls from other countries are also exhibited here, such as America, Thailand, Poland, to Punch and Judy puppet theater of the English also gathered together a collection of other puppets. Gundala, Marionette Puppet Lenong Betawi, Statue People Tapanuli, and tools puppet performances also on display in this room. This place feels creepy dolls on display such as real. You can also down stairs are old and squeak. The indoor section exhibiting a collection of traditional masks. Native pride of the Indonesian puppet like Unyil also greet you. If you want to see this doll in action, you can attend a puppet show organized by the museum. The event was held on Sunday and lasted for four hours. This leather puppet show comes from a different area each week. You simply pay Rp.2000 to get into the museum which is located at Great Northern Way’s door. Puppet Museum is open to the public every Tuesday through Sunday at 09:00 to 15:00. If you want to find information about the history of Indonesian textiles including batik and therein, the Textile Museum is a great place to get an answer. Even in this museum you can make a batik training. The location of this museum is not too far from Tanah Abang market. This house is located next to the Office of Indonesia Power. The museum is less visible from the highway because it was blocked by the many street vendors. Once inside the museum, the atmosphere is actually very different from the atmosphere in front of the museum are hot and crowded. Atmosphere of the museum is very comfortable and quiet. The museum building was formerly the office of the Ministry of Social Affairs. But since 1967, turned into a museum. By simply paying Rp.2000, you can get around while looking at a thousand traditional Indonesian fabric collection with a wide variety of decorative motifs, batik cloth belt, weaving, rainbow, prada, songket, and dyed a pretty neat display throughout the room. All of these fabrics are made using a variety of techniques, ranging from screen printing, printing, hand painting up. In addition, the museum is also exhibiting a collection of looms and batik from several regions in Indonesia such as wax and canting. On the back of the museum, you can find a wide variety of plants that can be treated as a natural dye fabric. The back of the museum is also a pavilion which is used as a place to learn to make good. The process of learning to make better use of cloth the size of a handkerchief. You will be taught how to paint motifs using canting and malam. When finished, dyed fabric to be colored. This training typically spend up to an hour. If you want to be satisfied again, you can follow the course of making batik. No longer on a handkerchief, but on top of the fabric with a width of 1.5 meters. Curious to try? Let’s come to the Textile Museum is located at Jl. KS Tubun no.2, Jakarta. The price of admission for Rp.2000, cost about Rp.35.000 batik workshop to 200.000. The Museum is open every day from 09.00 till 15.00. The kite is not just a toy. However, already a global culture. The museum is located in Pondok Labu. Once inside the museum, you are greeted by a cool atmosphere and beautiful. Almost in every corner building or pavilion displayed a diverse collection of kites. Red pavilion is a kite showrooms. He might look small, this room has a collection of the most complete kite from domestic to overseas. Some of the collections on display include regular kites, batik, 3D, puppet people, and other collections from nearly all corners of Indonesia. You can also find largest Indonesian kites from Bali and miniature kites with a size of 2 cm in this room. kite-making equipment as well as the history and utility of the kite also displayed in this room. In addition to a collection of kites, White Hall which contains a collection of batik and traditional fabrics from various parts of Indonesia are also available at the museum. many rare fabric with motifs that are exhibited here. All fabric is a private collection that is now not used by the owner of the museum. Not only see it, it turns out you can also participate in a variety of training to make a kite, making batik, to create a craft of ceramics. Ceramics that will be made will be colored in advance by the museum team can take home. While batik is made with size 30 x35 cm can be taken home. If you do not follow the workshop, visitors are taught to make a kite using origami paper. The museum is located at Jl. H. Kamang, Pondok Labu, Jakarta. Museum admission price is Rp 10,000 and to join you have to pay 40,000 Workshop (minimum group of 5 people). The museum is open every day starting at 09:00 to 17:00 (except national holidays).